NASCAR’s national series roster got just a little bigger this week thanks to a pair of announcements regarding driver debuts at Martinsville Speedway in the Camping World Truck Series. Tyler Ankrum will make his series debut with DGR-Crosley in the team’s No. 54, while Chase Purdy will attempt to make his first Truck Series race in MDM Motorsports’ No. 99. Nothing out of the ordinary here; Martinsville is oftentimes a spot for drivers’ premiere races, given that it’s generally one of the first tracks on which a newcomer is cleared to race. It’s also one of the few speedways on the schedule that allows competitors 16 and 17 years old to race; that distinction alone has led racers like Erik Jones, Cole Custer and Chase Elliott to make their maiden national series appearances there over the last half decade alone. Ankrum and Purdy are both worthy additions, too. The former recently won the 2018 K&N Pro Series East championship for DGR-Crosley, while the latter has scored nine top fives and 13 top 10s in his first full ARCA Racing Series season heading into this weekend’s season finale at Kansas Speedway. This part of the season is often inundated with these kinds of drivers. Prior to the announcements of Ankrum and Purdy, GMS Racing revealed that Sheldon Creed and Tyler Dippel, both standouts on the ARCA and K&N circuits as well, will compete for the team in the final four Truck races of 2018. Cole Rouse, currently the runner-up in K&N Pro Series West points prior to its Oct. 27 finale, made his XFINITY Series debut last month for BJ McLeod Motorsports. And in 2017, six different drivers made their first series starts in one of the three national series’ final five races of the year, four of which were making their first national series starts, period. It’s very possible Ankrum and Purdy will be the only ones this year, but bear in mind that they’re far from alone among their peers in terms of young drivers deserving of a shot at the next level. Here are five other drivers from the K&N or ARCA ranks who could show up on the national level for the first time before the end of 2018 — or at least should, if money wasn’t an object. At 16 years old, Chandler Smith is only able to compete in the Truck Series — and his ability to do so only came as of June. So you’d only see him at Martinsville or ISM Raceway if anywhere at all, but judging by his ARCA exploits in his maiden season on that circuit, he’s certainly earned a shot. 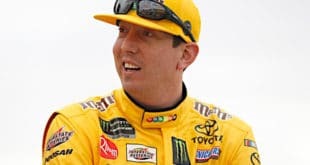 In nine starts with Venturini Racing in 2018, Smith has scored two wins, and in his first four appearances, he qualified on the pole each time out. Sure, he’s won with Venturini, one of the top teams in the garage, but this isn’t like a few years ago when the organization was miles ahead of its competitors; MDM Motorsports’ entry into the series has given the team some definite competition, and even still, Smith has often prevailed or has at least come close to doing so. If he doesn’t show up this year, expect him somewhere in 2019. Chances are you’ve heard Hailie Deegan‘s name thanks to her recent win at Meridian Speedway in the K&N Pro Series West, becoming the first woman to win in the series’ history. The daughter of motocross rider Brian Deegan has been strong in general in her first K&N season, currently sitting fifth in points, while competing for Bill McAnally Racing. Deegan turned 17 in July, meaning she, like Smith, could only compete at Martinsville or ISM in the Truck Series before the end of 2018. But aside from her standing as a rare woman to win in a NASCAR-sanctioned race, recent photos from the BMR shop have shown a truck chassis in the background, leading to the rumor that Deegan — or one of her teammates — could be on her way up soon. Like Deegan, Derek Kraus seems to be a driver with a particular upside in the K&N ranks. 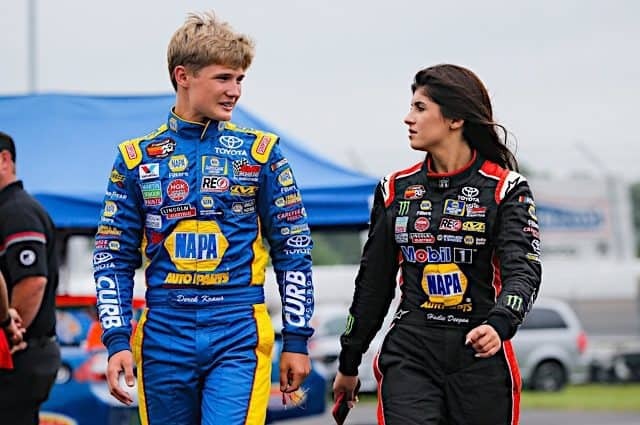 The newly 17-year-old Wisconsin native (turned 17 last month) has followed up a one-win rookie K&N West season in 2017 with three wins thus far in 2018, one of which came in the East and West series’ combination event at Gateway Motorsports Park. Kraus has also competed with DGR-Crosley on the East level, giving him a more direct pathway to the Truck Series if the opportunity presented itself. His sponsorship from NAPA and Curb Records, both longtime sponsors on multiple NASCAR levels, could help matters as well. Enough of the youngsters; how about someone who could actually race somewhere outside Martinsville and ISM in the Truck Series this season? 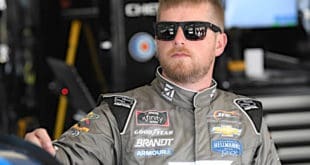 It’s somewhat surprising that the 24-year-old Travis Braden has still yet to climb aboard a vehicle in a NASCAR national series (he was announced to be splitting the No. 66 for PEG Racing in the 2016 XFINITY Series with Travis Kvapil and Tyler Lester, but the car never materialized). He won in his debut ARCA start in 2014, but seat time had remained a concern until this year, when he ran his first full-time ARCA season with RFMS Racing. The wins haven’t come, but Braden has remained decent in a single-car operation with less funding than many of the drivers against whom he’s competing. One wonders if he could slot in at one of the smaller XFINITY or Truck teams for a race, much like Rouse did. In 2013, Derek Thorn attempted to qualify for his first XFINITY race, driving Jimmy Means Racing’s No. 52. He was one of six to not make the field, and somehow, he’s never been back to the national level. That’s a shame, because not everyone can say they have a K&N championship under their belt — let alone a potential second one, should he hold on to the West standings lead (he’s ahead of Rouse by 26 points entering the finale). Thorn has been remarkably consistent in his return to Sunrise Ford Racing in 2018 after a few years away from the full-time K&N circuit, finishing in the top five in all but one race. He’s 32, which puts him significantly older than his peers on this list (especially at a time when many teams are looking for the young new thing), but his results speak for themselves, and it’s time to give him another shot on the national level if he wants one. 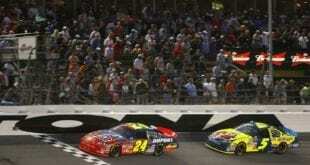 Previous Friday Faceoff: Is There Such a Thing As Home Track Advantage? How come you never mentioned the short track late model wins and endeavours of these drivers? If you are going to write about why these kids would be good to move up, tell the whole story.